Secure Document Sharing - Sencia Canada Ltd.
DocShare is a Secure Document Storage System that allows you to securely and easily store, manage, and share files with team members. With restricted access to their personal desktop, professionals can obtain classified reports and documents anytime, anywhere that they have internet access. Whether your team is internal to your organization or from various businesses across the globe, DocShare will help keep you connected. Group-based restrictions let you set who has access to your files. 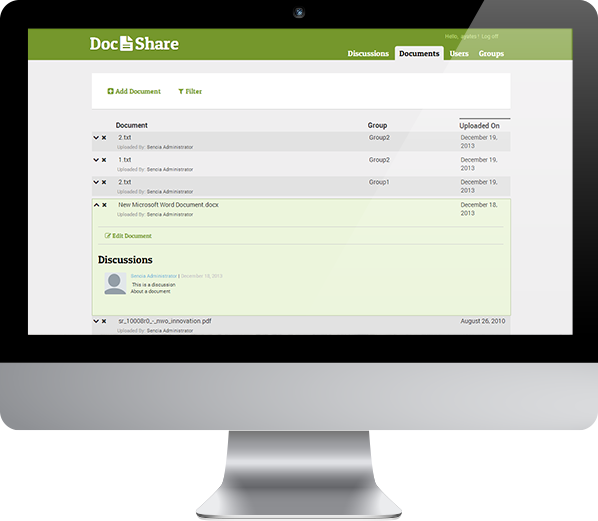 DocShare is also a completely standalone system so you can easily keep your sensitive information separate from your website. Start a conversation either about a document or include one in your discussion. Great for executive boards and committes to share their thoughts on files securely.